The sheer tightness of Rouen meant only 20 cars were allowed on track at the same time, so the 27-car field had to be split into two groups for the Friday and Saturday practice. This is effectively a lottery, with one group generally getting the better of the conditions. This was certainly true this time, with group A getting the best conditions on Friday and Saturday while Group B struggled on a dirty track Friday and had to deal with rain on Saturday. The Project Four run Ralt-BMWs were the cars on the pace early, Eddie Cheever and team-mate Ingo Hoffmann setting fastest time in their groups. Cheever eventually claimed pole with a stunning 1m 45.3s lap, 2 seconds faster than Alex Ribeiro’s pole time from the year before. Didier Pironi was next in the faster group B, half a second slower than the American in his Martini-Renault, with Riccardo Patrese in his Chevron-BMW a second slower in 3rd. Next was Gianfranco Brancatelli, going well in his Ferrari-engined Ralt RT1, followed by 1976 winner Maurizio Flammini who had managed to get a last-minute drive in the Opert Chevron-Hart. Alessandro Pesenti-Rossi in a March-BMW, Marc Surer in a similar car, Bernard de Dryver in another March, José Dolhem in a Kauhsen-Renault and Jean-Pierre Jaussaud rounded out the top-10 qualifiers from group B. 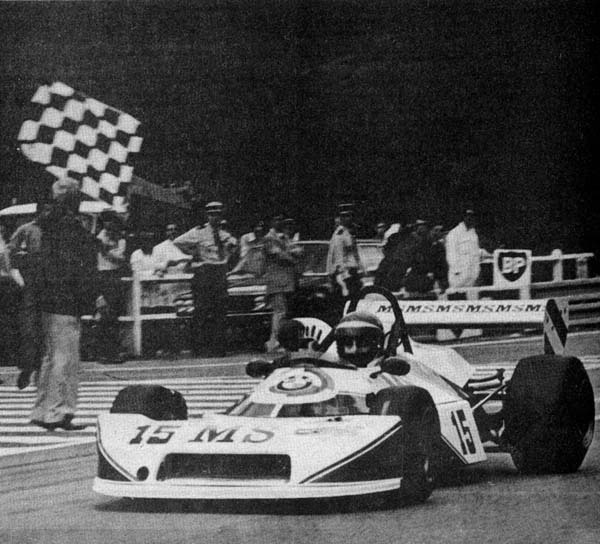 Like Flammini, Dolhem was also a last-minute entry after Klaus Ludwig elected to quit the Kauhsen team which was having very poor season. Group A was headed by Patrick Tambay in his Chevron-Hart. His time of 1m48.3s was three seconds slower than Cheever’s pole time from group B, reflecting the differences in track conditions. Next up was Championship leader René Arnoux in his Martini-Renault, closely followed by Hoffmann. Bruno Giacomelli in a March-BMW was fourth despite an accident caused when his diff broke, followed by Alberto Colombo and Gaudenzio Mantova, also in March-BMWs. Freddy Kottulinsky was next in a Ralt-BMW, then came Ricardo Zunino in another March-BMW, Norman Dickson in a similar car, and finally last year’s pole winner Alex Ribeiro who was a last-minute replacement for Jacques Laffite in the Opert Chevron. Danny Sullivan, Michel Leclerc, Pierre Maublanc, Michel Pignard, Wink Bancroft, Xavier Lapeyre and Lamberto Leoni were the unlucky ones to miss out. With the very different track conditions encountered by the two groups in mind, it would not have been fair to simply select the 20 fastest times to qualify. Instead, a grid formation was chosen in which the top-10 qualifiers from Group A lined up alongside the top 10 from Group B. So we had Cheever alongside Tambay on the front row, despite Tambay being 7th quickest overall, with the second row consisting of Pironi and Arnoux, and so on down to position 20. Sunday was warm and sunny for raceday, and a very interesting race was expected. However six cars were effectively removed from contention immediately. 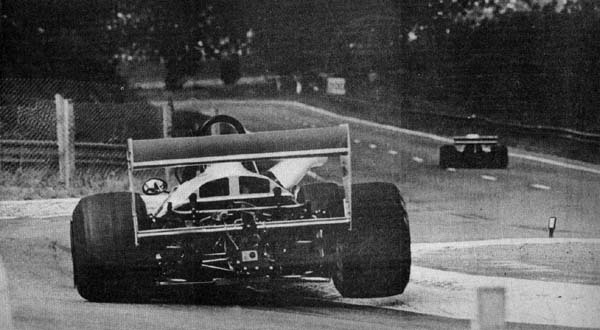 No one is exactly sure what happened, but Tambay was touched into the path of Arnoux, causing a chain reaction that saw a number of cars affected. Tambay and Arnoux climbed from the wreckages of their cars, Hoffmann, Zunino and Pesenti-Rossi were forced to pit with damage, Flammini managed to avoid everything but had to begin again after having a big spin, and Patrese was luckiest of all, being able to continue unhindered despite getting a big dent in his rear wheel. The result of all this was that much of the potential excitement was taken from the race. Cheever was alone at the front, and the American proceeded to romp away to take a comfortable victory, his first in Formula 2. He even claimed afterwards that it had been easy. He held the lead at 12 seconds for most of the race, then pulled right way at the end. Patrese was next home, a full 79 seconds behind, after getting past Pironi and then thwarting his challenge. Patrese was troubled by his wheel damage for most of the race, but Pironi never looked likely to get past him again. Early on a three way tussle for 2nd had been underway between the aforementioned pair and Giacomelli, but Giacomelli’s engine exploded comprehensively on lap 7. Brancatelli was well back in 4th, with Colombo battling a slow puncture in 5th. Surer, Mantova, de Dryver and Zunino were involved in a real battle for 6th, until Surer lost his clutch on lap 12, and Zunino saw his chance trying to get past the other 2 ahead of him. However, he cut the corner much to finely, and damaged his nosecone, forcing another pitstop. De Dryver lasted a few more laps before being side-lined by fuel issues, and finally Mantova’s engine expired on lap 16. Attention then turned to the unfortunate Hoffman, who was charging back through the field, and by this time was closing at more than 2 seconds a lap on 5th placed Colombo. Colombo’s team had miscounted the laps though, and they ignored Hoffman, thinking he was still a lap behind. Hoffman duly went by into 5th place, and it wasn’t until afterwards that Colombo realized he had finished 6th. Ingo Hoffmann's brilliant recovery is graphically shown as he hurls his Project Four Ralt-BMW through Virage des Roches. Hoffman topped off his great drive by setting the race’s fastest lap 1 lap from the end, a 1m 47.05s time. It was a brilliant performance from Hoffman, and many wondered if the race might have been much tighter had he been able to race Cheever at the front. Rebeiro crossed the line 7th after a lonely race, with Kottulinsky 8th, Flammini 9th, and Zunino rounding out the top 10. Dickson came home last finisher in 11th after a difficult race with a slipping clutch, while Dolhem continued Kauhsen’s miserable season as he struggled with throttle problems and bent steering, which eventually forced him into the fence and out of the race. Rouen had built up a reputation as a car, and in some cases, driver-breaker. 1977 saw the circuit claim its final victim. During practice for the Formula Renault race, François Burdet was accelerating up the hill between Nouveau Monde and Sanson when his Formula Renault suffered a mechanical failure. The little Renault was launched into and over the Armco barriers and into the trees. Burdet died shortly after in hospital. 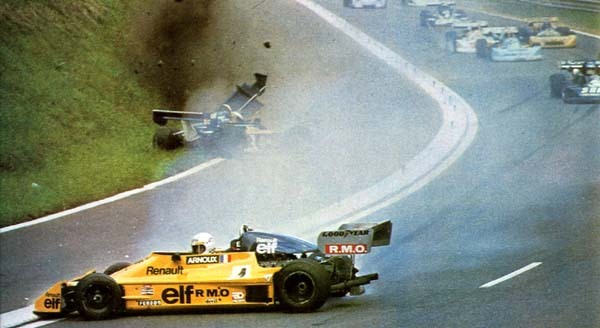 The accident underlined the dangers still present at Rouen, despite all the work to improve safety, and hastened the departure of F2 racing from the circuit. 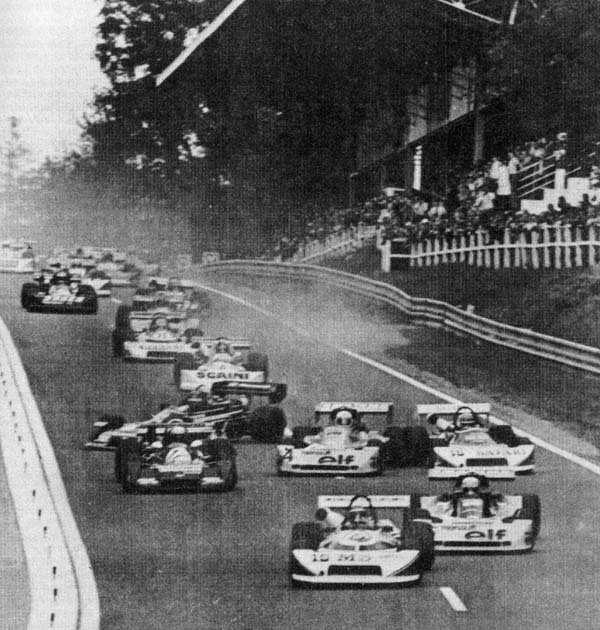 The 1978 Grand Prix de Rouen would be the last time F2 cars would be seen at Rouen.